I’ve been building computers/servers for roughly 11 years now–first build in 2006 was an Athlon 64 3800+ with a Geforce 6600–and I’ve always only cared about the components themselves, less so what the case or innards look like. I hit a sort of “midlife crisis” where I wanted to make my home box look really cool. 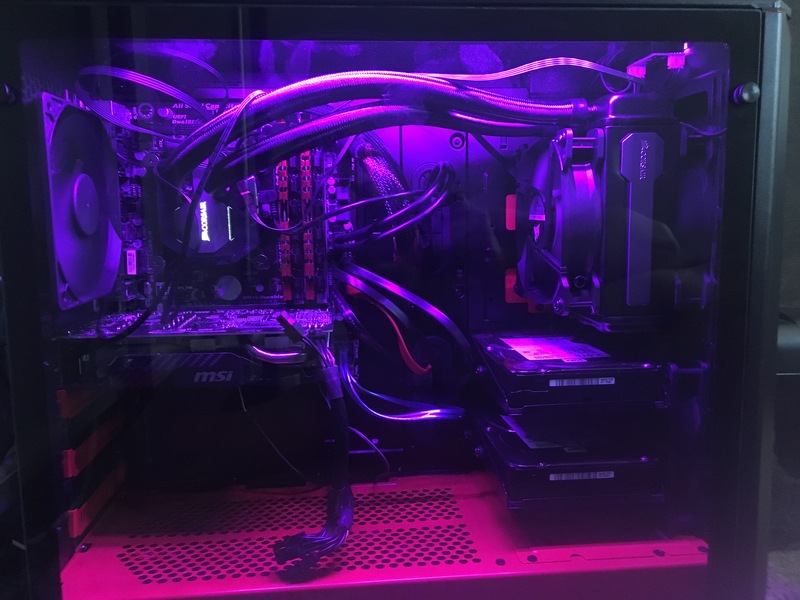 At the time it had 6 hard drives–two mdadm raid1 arrays + 2 SSDs carved using LVM–and I wanted to upgrade to a case with a window, as I was using a windowless Nanoxia Deep Silence 4. The DS4 is a great case but it’s not meant for flashyness. When I built it I hadn’t cared about cable management so it was a mess on the inside. I opted to go with a Phanteks P400s TG Red Edition as it had a huge tempered glass side panel, LED lights, and room for 8 drives: 2 SSDs behind the motherboard panel, 2 3.5″ slots in the basement, and 4 optional drive slots in the front. 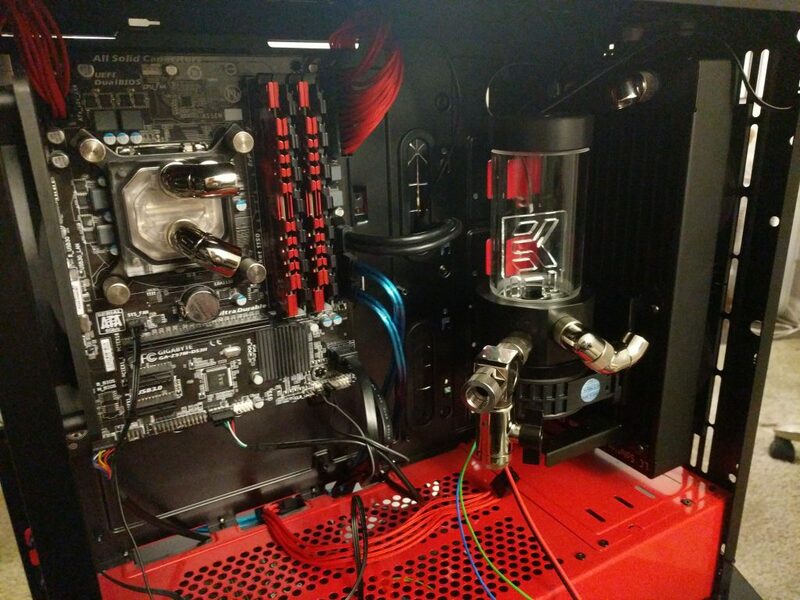 At some point I was convinced to try liquid cooling. I was able to fit a Corsair h80i v2 at the front of the case and it worked really well. Yet I wanted more. 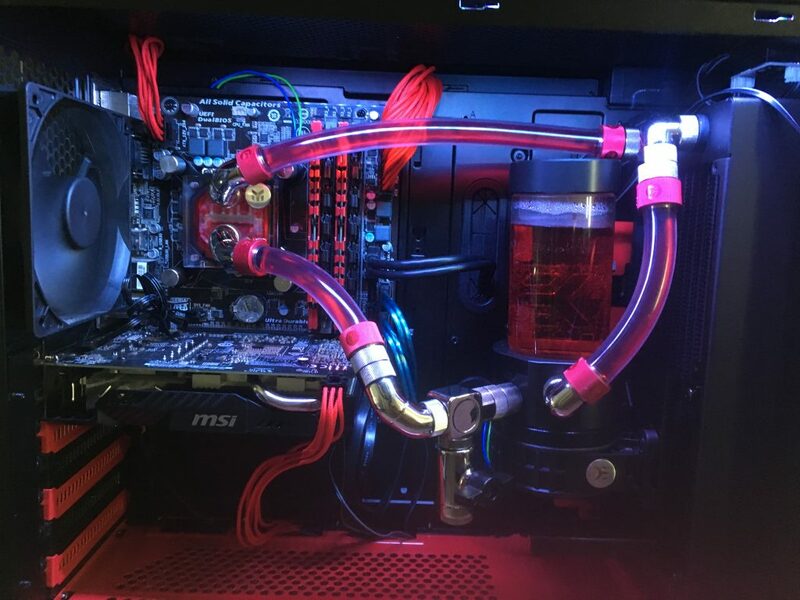 I spent a month researching custom liquid cooling loops, mostly through reading EKWB’s excellent guides and watching Jayz2cents awesome water cooling tutorial videos. I chose the P400s primarily for the drive capacity; at the time I was still averse to liquid cooling so I didn’t plan for it. The P400s falls short for liquid cooling in that the top can’t fit dual fans + a radiator as the motherboard is too high, and the length of the case doesn’t easily permit a custom loop with a full length graphics card. The basement has–undocumented–pump mounting holes but they aren’t useful when you have a radiator+fans installed. I opted to go with EKWB parts and a single 240mm rad in the front of the case with the pump+res combo mounted against the rad itself. It all came together quite nicely with a few caveats, after i migrated down from 6 drives to 4 to remove the extras visible in the case taking up radiator space. 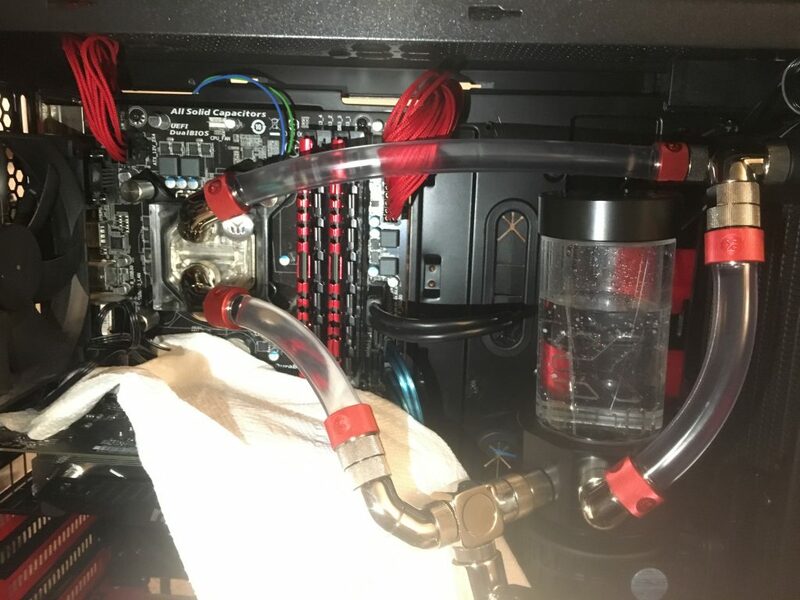 – Instead of mounting the pump+res against the radiator, drill holes at the bottom right part of the case so the reservoir tube is just flush against the radiator, to free up lots of room for a full length GFX. It’s possible I’ll need more radiator space, and I’ll need to decide between adding 120mm radiators in the rear and the top-right part of the case, or going with a different case altogether. I’d like to avoid going with a separate case as alternatives either feel wasteful, look ugly, or are too big. The Phanteks Enthoo Evolve is pretty much meant for custom liquid cooling loops, but I hate how the front of it looks. The Fractal Design series would work, but they just have window/plastic side panels instead of tempered glass.